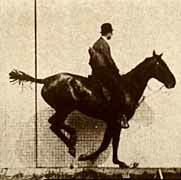 Muybridge Animal Locomotion Study — Animated. As part of the California Historical Society's exhibit on time and motion as captured in 19th Century Photography, Eadweard Muybridge's landmark stop motion photography is brought to life in these computer animations. To learn more about Moment and Momentum contact the California Historical Society, 678 Mission St., San Francisco. (415) 357-1848. Historic photography courtesy of the California Historical Society ©2000. Composite panoramic imagery presented by Thomas Bachand, ©2000.